ISIS may soon trade places with the Yazidis! Remember all of those news reports about the refugees fleeing from ISIS into the mountains of northern Iraq? Well those people are still stuck in those mountains. ISIS invaded the northern Iraqi town of Sinjar driving many of its citizens out and up the Sinjar Mountain just to the north of the town. Sinjar is a town in the Nineveh Province of northern Iraq with a population of about 80,000. Sinjar is about a two hour drive from the city of Mosul. Mosul is the headquarters of ISIS in northern Iraq. We haven’t heard much about these refugees since ISIS drove them into the mountains. The refugees belong to a religious sect called the Yazidis. The Yazidis’ religion combines Zoroastrian, Islamic, Christian, and Jewish components. They consider themselves separate from every other religion and society. The Yazidis were a minority religious group living in the town of Sinjar. The Yazidis have struggled to survive on the mountain for the past year or so. Thousands have been killed or captured by ISIS fighters. The US has conducted some food airdrops, but the Iraqi Kurds have been the Yazidis’ greatest help. The Kurds have battled ISIS troops to clear a supply route up the northern side of the mountain. Lately the Kurds have taken back much of the city of Sinjar from ISIS. There is some optimism that the Yazidis may soon be able to come down off of the mountain and return to their homes in Sinjar. The Yazidis have been stuck living on the mountain for almost a year and a half. They have received a little help from the US and a little more from the Kurds. 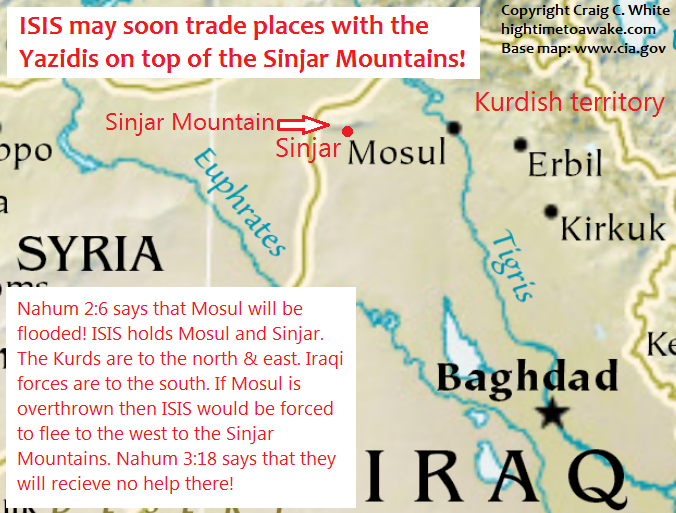 ISIS may soon trade places with the Yazidis on top of the Sinjar Mountain. The bible tells us that ISIS may be driven up those mountains where they will receive no help from anybody. Today the city of Mosul sits in the same place where the ancient city of Nineveh sat. The Prophet Nahum predicts the flooding of Nineveh. He says that the Tigris River will overflow destroying the city! The Prophet Nahum may also predict the flooding of the modern day city of Mosul! Nahum 2:6 The gates of the rivers shall be opened, and the palace shall be dissolved. The refugees of ancient Nineveh fled to the mountains. ISIS in Mosul may also be forced to flee to the mountains. Nahum 3:18-19 Thy shepherds slumber, O king of Assyria: thy nobles shall dwell in the dust: thy people is scattered upon the mountains, and no man gathereth them. When the Yazidis were stuck on the mountain they received some mercy and help from the world’s citizens. When ISIS is at last trapped on the mountain nobody will try to rescue them or to help them at all. Listen to my verse by verse Bible study through the Old Testament book of Nahum titled The End of ISIS is near! Read all about the Prophet Nahum and the future destruction of ISIS in Mosul in my book The End of ISIS is Near! Another classic case of reaping what you sow. Isis is about to learn this principle the hard way.